An appropriate set of Change Parts, determined by the can type and size being tested, are installed in the unit. A sample is installed on the Change Parts and the test chamber is sealed. 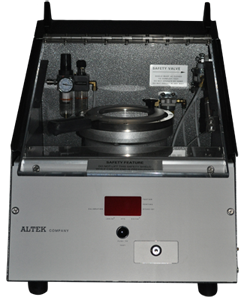 Air Pressure is applied to the outside of the sample until it fails; the failure pressure is indicated on the front-panel mounted digital display. This unit requires the use of Change Parts. Please see 9794 ; 9794A ; 9794B ; 9856 ; or 9859 for further information.